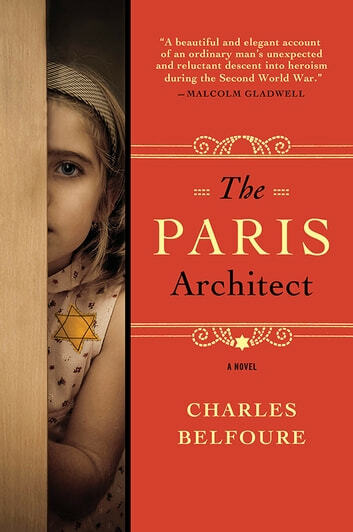 In 1942 Paris, gifted architect Lucien Bernard accepts a commission that will bring him a great deal of money  and maybe get him killed. But if he's clever enough, he'll avoid any trouble. All he has to do is design a secret hiding place for a wealthy Jewish man, a space so invisible that even the most determined German officer won't find it. He sorely needs the money, and outwitting the Nazis who have occupied his beloved city is a challenge he can't resist. But when one of his hiding spaces fails horribly, and the problem of where to hide a Jew becomes terribly personal, Lucien can no longer ignore what's at stake. The Paris Architect asks us to consider what we owe each other, and just how far we'll go to make things right. I loved this book.. the French perspective during world war two was interesting and an easy read. I could not put this book down for long. A good history of the German occupation in France, specifically in Paris. I enjoy reading fiction about WW11 and enjoyed this writer's. I was surprised by many things: that a spouse would actually leave his partner because he or she was Jewish; that it appeared the French already disliked the Jews before the occupation although they had been friends and co-workers; that just by looking at a Jew, you knew they were Jewish. I really enjoyed how Lucien evolved to who he became. The subject matter regarding the treatment and concealing of Parisian Jews was very interesting and compelling. I found myself wanting to get back to reading but I found the conversational prose a bit stilted and perhaps some of the occurences too pat. But I would highly recommend this story to anyone looking for a heartwarming read. This book shows us life during Nazism second war time. How Germans under Hitler's order manage and control Paris . also about bravery of French men trying to safe Jews or descendants from death, concentration camps, prison,hunger. I recommend this book. You have to be a lover of history to appreciate the setting of the place and the story told by the author. The character development is good and the story ends on a positive note. We gave Lucien with great architecture knowledge but lacking wisdom. But his hard learned experiences start to give him the wisdom he needs to make the right choices.